The TS5322 series air operated spool valves are suited to making controlled deposits of many medium to high viscosity gels and pastes. The valve body is made from aluminium for low maintenance handling of thick materials such as RTVs, silicones, sealants and grease. A piston moves back against the flow to shut-off and prevent material oozing. Designed to dispense medium to viscous materials fed from syringes, cartridges or pumps. The TS5322 provides repeat deposits of sealants, silicones, RTV, grease and pastes. TS5322 valves are approximately 4.0 Inch (101.6mm) long and 1.38 Inch (35mm) wide. They weigh approx. 0.31 lbs (141g). The minimum operating air pressure required is 70 psi. Flow rates (water) are approx. 2700cc/ml gallons per minute @ 100psi (maximum free flow area is measured without dispense tip adapter, which creates reduced output area). The minimum shot size for the valve is approximately 0.002 cc/ml and these valves will cycle up to speeds of 700 deposits per minute. The viscosity range of fluid is recommended at between 5000 - 1 Million CPS. The maximum fluid pressure is 500psi. The repeatability is +/- 0.2%. Recommended digital timed controllers for these valves are the TS250, TS350 and TS500R. 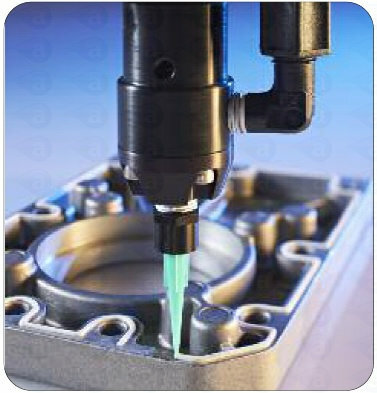 Typical applications for this valve include edge sealing using silicones and sealants, filling and packaging, automated paste dosing. Summary: Dispensing valve includes airline hose with quick connect fitting, mounting bracket, tip adapter, fluid inlet adapter fitting, selection of tips, user guide. Delivery: Products shipped by courier on a tracked and insured service for stock items. Products on a longer lead time or built to order will be sent as soon as available. Customers will be informed of ship dates.